This is the first part of a map pack with Runescape maps. Links to the templates of maps will be in this description. Unfortunately, due to the way Warlight works, you cannot give individual maps ratings, but must rather give the whole pack a rating. Feel free to give individual ratings in the review section. In addition, only the map that was released at the latest point in time is available through the create game screen. I have choosen to do it in this fashion owing to several maps sharing some territories. Thanks for your understanding. Review by Nathan on 2/16/2017. Very cool. Makes me want to learn more about Runescape. Review by Master of the Seas on 12/13/2017. 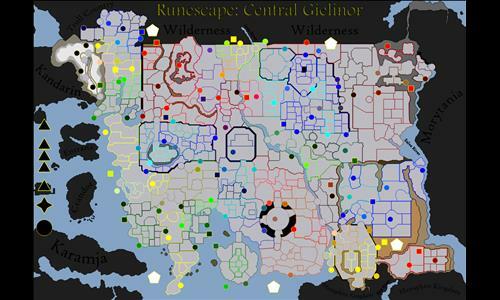 A beautiful map of Runescape with a wonderful level of detail. I particularly like the Holy Saradomin War setup, as none of the locations seem too overpowered and victory seems possible from all of them. - A few typing errors (Monastery of Saradomin - Karamja Ship - Entrana Ship - Abbess Benita's Office - Lumbridge Castle - Count Draynor's Manor - Phoenix Gang Entrance) being the ones I picked up on. - Some connections around Varrock where the city walls should block passage, especially on the south and western walls. - Digsite bonus of 20 seems too high, 10 seems better. I'd also add some quirky bonuses, like controlling all pubs or banks, since all the territories exist already anyway. Other than that though, a solid map which I enjoyed playing thoroughly. Hope to see more parts of the world and hopefully a huge super-map! Excellent work. Hi, thanks for the review; I'm glad you like my map. A new version of the map is pending public that has corrected the names you specified. That is, with the exception of "Count Draynor's Manor". I don't understand what you meant there. Though I did change "Drakon's Manor" to "Drakan's Manor" (spelling mistake). A lot of that (the wall) is artistic license; how I want the map to feel and be split up. For the sake of argument, however, most of the southern and eastern part is not an actual city wall, but just the houses being adjacent to each other. Sorry, not changing bonus-values. People must decide for themselves where to begin and which bonuses are worth going for. I did not intend the map for auto-distribution, but you can of course make templates with other values. I'd love to make other areas of Gielinor, but it does take a lot of time :( There are no maps detailed enough, so I have to run around in Runescape while I draw in Inkscape. Review by Toby Wan Kenobi on 1/13/2018. Review by Van Lån Hin on 1/13/2018. Review by A_B3 on 11/19/2017.